This tiny pixie hat is aimed towards early or premature infants (up to 6lbs/2.75kg) It is unisex in design. 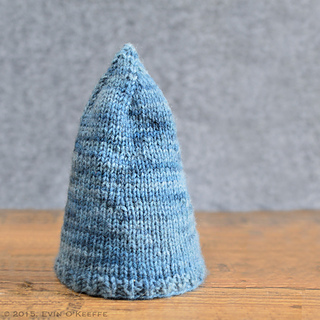 This is a simple hat that looks beautiful in a patterned or plain yarn. Tools: 5mm or 8 US DPNs or 16-inch (40.64cm) circular needles, or size needed to obtain gauge. Tapestry needle.